For so many times, I witnessed several people who just go ahead of their cravings and eat right away without washing their hands. Imagine the millions of bacteria they just injected to their bodies and the diseases they could cause. Worst is, these communicable diseases could pass on to friends and all members of the family. It is quite alarming that many of us are not giving attention to this. We can do a big change or control the diseases to spread by just washing our hands! Look at the photo below that I just spotted in one fast food chain. 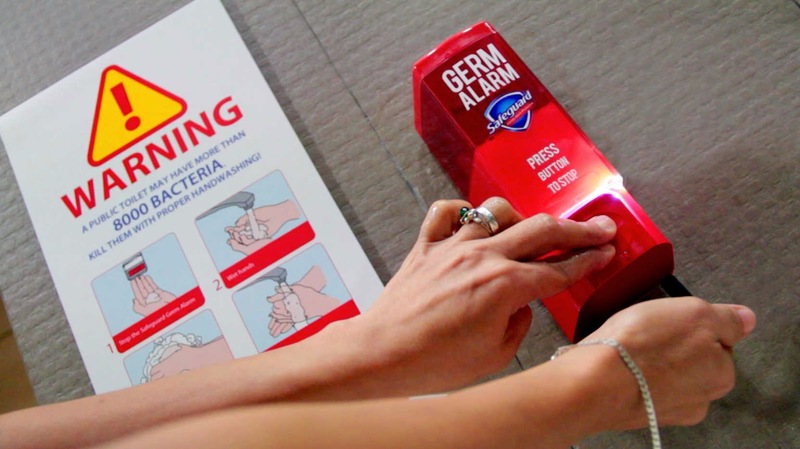 This is the Safeguard Germ Alarm especially invented to tackle the issue of germs in public restrooms. Alarms were initially installed in McDonald’s branches around Metro Manila, schools and offices. It alerted more than 10,000 people to wash their hands after using public toilets. I'm glad that DOH, Unicef and other NGOs have been very active in promoting hand washing. They launched Global Hand Washing Day, co-founded by P&G, to promote the life-saving habit of handwashing with soap. As a parent it is my responsibility to teach my children about hand washing from an early age. In that way, I know that my children will be protected even when I am not around to remind them. I always make sure we use only a soap that kills 99.9% of germs that cause illnesses such as diarrhea, cough, colds and pneumonia and I trust only Safeguard for this. How Safeguard Germ Alarm works. The Safeguard Germ Alarm will alarm a person who use the toilet and will only stop once the soap dispenser is pressed. Here are some tips to wash hands properly. 3. Rub your hands palm to palm with fingers interlaced. 4. Rinse hands with water. 5. Dry thoroughly with hand dryer or single use towel. According to a research study by Michigan State University, only 5 percent of people who used the bathroom washed their hands long enough to kill the germs that can cause infections. Also, 33 percent didn’t use soap and 10 percent didn’t wash their hands at all. Please check out the video that I embed here from YouTube. Kudos to P&G for inventing this simple gadget, the Safeguard Alarm Soap. I hope this hand washing that started with Germ Alarm becomes our lifelong habit. This is so easy to accomplish and with this, we can make a big difference for a healthier life. i don't know if my comment went to spam... I hope hindi sya na spam..
We should really make hand washing as a habit. I hope P&G will install more hand washing gadget in public toilets so that it will be available to more people. Great gadget! It promotes hygiene to all who will use the CR. What a brilliant idea from Safeguard! With the Safeguard Germ Alarm, many people will be reminded to wash their hands after using the toilet and help them avoid getting sick.